So tonight are the Closing Ceremonies, and lots of people have requested that I do Olympics nails over the course of the past few weeks, and wellllll, tonight is my last chance!! Pardon the shakiness, I just got home, I went to class from 8-1, hockey game from 130-5?, and drinking from 5-7 or so with some buddies from work. Good times. Note to self: NEVER drink Newcastle after SUPER-hoppy IPA, will taste horrible and like nasty caramel. Anyway, on to the nails. I used Sally Hansen All the White Stuff, China Glaze Salsa for the red, Pure Ice French Kiss for the blue (and mixed with Sally Hansen All the White Stuff for the midsection of the logo body), Zoya Raven for the black, Diamond Cosmetics #319 Lemon Yellow Zest for the yellow, and Nubar Forest for the green. Topped everything off with 2 coats of Seche Vite top coat. That is so cute, I love this! owww, i loved, i want! 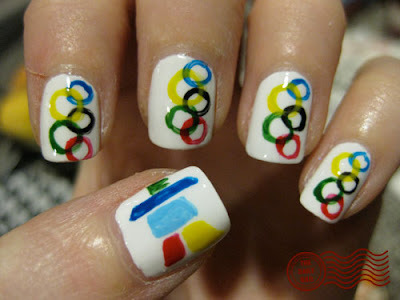 great nails! who was your fav person in the olympics? mine was Apolo Anton Ono! Much better than my version that I posted on your facebook page! !